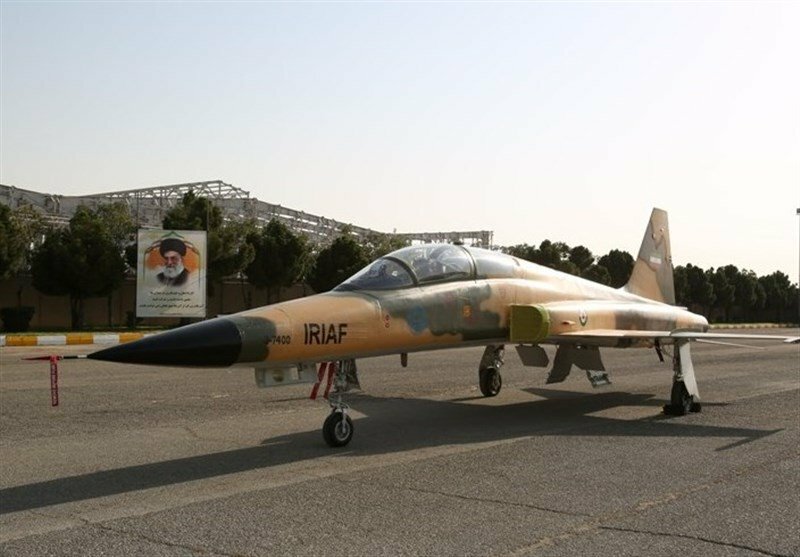 Iran "designs" it's own fighter jet, jet fighter. Kowsar they call it and insist "100% made in Iran". "We had to paint over the old insignia and infidel flags and we used 100% Iranian made paint for it. We replaced the worn out cushions on the chairs and put on 100% Iranian camel leather making the seats very luxurious and all Iranian made. Didn't dare to try to change the gauges themselves out of fear we might break something." According to the original sources the pictures were also taken with 100% Iranian camera that resembles a Sony just by coincidence. For proof they showed the camera and pointed out the Iran's flag sticker where the Sony title would have been. Next week they'll unveil 100% Iranian designed and made 1940's Kalash.. Iranian assault rifles named after a hill in Koran, 100% manufactured and designed in Iran. The US Navy has said it will re-establish its Second Fleet, as Russia becomes more assertive. Chief of Naval Operations Adm John Richardson said the fleet, disbanded in 2011, would oversee forces on the US East Coast and North Atlantic. He said the National Defense Strategy, published earlier this year, made it clear that the era of great power competition had returned. The strategy makes countering Russia and China a priority. The fleet, which was disbanded for cost-saving and structural reasons, will be based in its previous home - Norfolk, Virginia. "Our National Defense Strategy makes clear that we're back in an era of great power competition as the security environment continues to grow more challenging and complex," Adm Richardson said in an announcement on board the USS George H W Bush at Norfolk. "That's why today, we're standing up Second Fleet to address these changes, particularly in the north Atlantic." The re-establishment of the US Second Fleet is part of a wider strategy of re-orientating the US armed forces towards a world of renewed big power competition and away from the counter-insurgency campaigns they have been fighting over recent decades. In this case the focus is Russia - a response to its stepped up naval activity of recent years. The new headquarters will give more coherent command arrangements for US warships operating in the Atlantic. Nato is also planning to set up a new Joint Forces Command covering much the same region - the Americans have offered to host this in Norfolk, Virginia. The existing pattern of US naval operations is also due to change significantly. US Defence Secretary James Mattis insists that he wants less predictable deployments, of shorter duration. Experts say a carrier strike group is likely to be deployed more frequently in European waters. Adm Richardson added that the fleet would "exercise operational and administrative authority over assigned ships, aircraft and landing forces". The headquarters staff would begin with just 15 personnel, increasing to more than 200. It has not yet been decided who will command the fleet and what assets it will include. Norfolk has also been proposed as a host for the new Nato Joint Force Command for the Atlantic. Nato officials say Russia has increased naval patrols in the Baltic Sea, the North Atlantic and the Arctic, and its submarine activity is at its highest level since the Cold War. Relations between Russia and the West have deteriorated in recent months amid allegations of Russian meddling in US elections, Moscow's support for President Bashar al-Assad of Syria and the poisoning of former spy Sergei Skripal, for which the UK blames Russia. The U.S Navy on Friday formally reactivated the Cold War-era naval command it relied on for decades to confront adversaries in the waters off North America — the latest in a series of efforts to check Moscow's military expansion. The move comes as Russian submarine activity surges in the Atlantic. The 2nd Fleet in Norfolk, Virginia, which was deactivated in 2011, will once again be assigned ships, aircraft and Marine landing forces for potential operations along the East Coast and in the North Atlantic, where melting Arctic ice has also heightened the competition for natural resources. “We as a Navy, as a nation, have not had to confront such peer competitors since the Cold War ended nearly three decades ago," one of the Navy’s top officers, Fleet Forces Command chief Adm. Chris Grady, said during a ceremony in Norfolk aboard the aircraft carrier USS George H.W. Bush. “Our sea control and our power projection, two vital elements of our national security, are being challenged by resurgent foreign powers, namely Russia and China,” he added. Chief of Naval Operations Adm. John Richardson, who issued the order earlier this year to re-establish the 2nd Fleet, stressed that the Navy is not “looking for a fight.” But he said realities demand that it maintain “a large-scale ocean maneuver warfare” unit in the Atlantic region. Earlier this year, Richardson told reporters that Russian submarine activity in the Atlantic is “more than we’ve seen in 25 years. The 2nd Fleet, according to the Navy, “will exercise operational and administrative authorities over assigned ships, aircraft and landing forces on the East Coast and the North Atlantic." It will also supply ships to other commands worldwide. That was an apparent reference to an aggressive Russian military buildup that led Defense Secretary Jim Mattis to issue a new National Defense Strategy in January. The strategy shifted the Pentagon from focusing primarily on counterterrorism to “great power competition." “This move is driven by Secretary Mattis,” said retired Adm. Melvin Williams, who led the 2nd Fleet from 2008 to 2010. “He came out with a defense strategy that shifted focus to major competitors, so 2nd Fleet, as they come back, will be more involved in the basics of dealing with a major competitor, be it Russia or China. "Whereas after 9/11 a lot of our emphasis was on dealing with terrorism and piracy and supporting operations in the Middle East," he added. "That’s the back to the future aspect of it." Indeed, while it will be much smaller in scale than its Cold War predecessor, the new 2nd Fleet will very much reflect its historic role. From its founding in 1950 through the end of the Cold War, 2nd Fleet was responsible for keeping tabs on Russian submarines and securing passage of allied forces across the Atlantic in the event of war. Even after the fall of the Soviet Union, the fleet remained a substantial force. Williams recalled in an interview that he commanded “on the order of 130 ships and submarines,” including aircraft carriers and amphibious landing vessels, and 90,000 sailors, Marines and Navy civilians. But at least initially, the new fleet will be a shell of what it was. But Lewis doesn’t actually control any ships yet, nor many personnel. Navy spokeswoman Lt. Cmdr. Ashley Hockycko called his outfit a “lean” headquarters that has yet to reach its planned manning level of 250." The fleet “will not immediately have oversight over assets until they reach initial and full operational capability at a future date to be determined, as they are being established using a phased approach,” she said. Over time, ships from other units will be folded into the 2nd Fleet. Hockycko added that the fleet’s first “high-end” training is scheduled for early next year. The move is one of several the U.S. and its allies have made in recent months to beef up naval and air forces in the Atlantic. Last month, the United Kingdom's Royal Navy announced plans to establish its own new headquarters with a similar role as 2nd Fleet, citing Russia’s military “resurgence.” NATO formalized plans in June to establish a new Atlantic Command, which would bring together the naval assets of the alliance in the same area 2nd Fleet is charged with patrolling, and the Pentagon has offered Norfolk as a likely headquarters site. It’s unclear what the relationship will be between the new U.S. fleet and the new NATO naval headquarters. But during the Cold War, 2nd Fleet played a key role in NATO’s Atlantic Command structure, with the 2nd Fleet commander also serving as the head of the alliance’s Striking Fleet Atlantic. NATO’s original Atlantic Command was disbanded in 2003 and 2nd Fleet gave up its NATO strike role in 2005. So, sounds like they have the formal ceremony part of re-establishing the 2nd Fleet done. Putin told Trump to order this. Right, because diverting all those sailors and ships to the Atlantic will mean that those ships and sailors cannot intervene in the deserts of Syria. The two DIY assault drone designed used in the January 2018 attacks on Russian bases in Syria. Incorrect - just ask any would be armchair marshall and they'll go "oh, just have swarms of drones, nothing can stop them". Then they will argue that military leaders have throughout ages lacked vision and been the least intelligent of the lot etc. etc. and thus they don't understand military like these civilians do after watching a season of The Walking Dead and a Michael Bay film, making them de facto experts on modern warfare. SPAAG that fires airburst and AA machine guns. And if you want to add even a shred of survivability and maybe an actual weapon suddenly you're not looking at 2,500$ drones anymore, you got to make it go high and carry a lot of weight. It starts to resemble a proper airplane all of a sudden. And you have to make it be able to do it's job somehow. You could just radio control it? But then again it could be jammed or worse - hijacked. But what about autonomous AI? Well, it has to know where it is and it has to see it's target. It relies on sensory input and a number of sensitive parts - because really, you're not going to be able to armor things like sensors, engines and weapons even if you started adding armor (and cost and size) to them. GPS location system itself can be tricked, sensors can be blinded without sufficient power to damage them - then again sensors are easy to damage by nature. Yes, I'm talking about energy weapons now, wide arc (say, 0.5 - 3 degrees angle) intense beams. Hundreds of drones? Brush the beam across them and they are all blinded. And then come all these EW options. Not forgetting about actual cloak and dagger espionage. Tiny little feature, the motherboard has a signal amplifier responding to specific wavelength - merely brushing the sky with the right wavelength on purpose knocks them out. Kind of a bitchy thing to deal with while out in the field and realizing the enemy has sabotaged your chips.